Why produce a Lymm Neighbourhood Plan? October 2018: Why Have a plan? Warrington Borough Council will shortly release a draft Local Plan for the Borough. The draft Local Plan will include policies that identify sites for residential development in Lymm which are currently in the Green Belt. Subject to a full council decision on 25 March 2019, WBC will be consulting on this draft Local Plan. The consultation period is expected to commence in April 2019. The Lymm Neighbourhood Plan Working Group wants to make you aware that commenting on the removal of sites from the Green Belt by WBC is not part of the Lymm Neighbourhood Plan Working Group’s remit. Any comments by residents, on the removal of these sites from the Green Belt, should be made direct to WBC during the consultation period, otherwise they may not be taken into account. 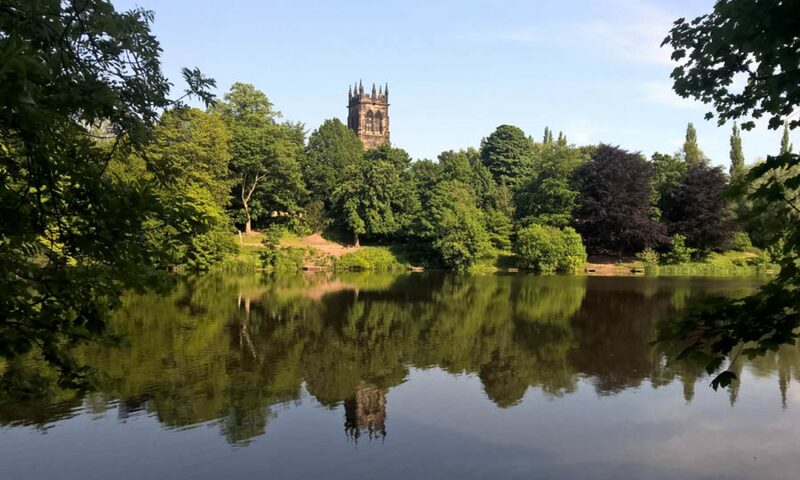 We’ve been able to publish a Heritage and Character Assessment for Lymm, as well as the Rural Place Profile, these are both available via our published documents page. Please have a read through. Thank you to everyone who popped in to see us at Lymm Village Hall on 13th October 2018 for the second consultation. We had a great turn-out and lots of feedback to work through. If you attended on the day and are looking to complete the questionnaire – it’s available at www.lymmplan.org/consult or via the menu bar at the top of the page. Lymm Neighbourhood Plan Group will be holding a second public consultation meeting TODAY, Saturday 13th October, 11am to 3pm at Lymm Village Hall, Pepper Street, Lymm. Please drop in at any time. We would very much like for you to attend and receive an update on what has happened so far and to have your say on how the Lymm Neighbourhood Plan will be developed going forwards. Please pass on / share with friends. 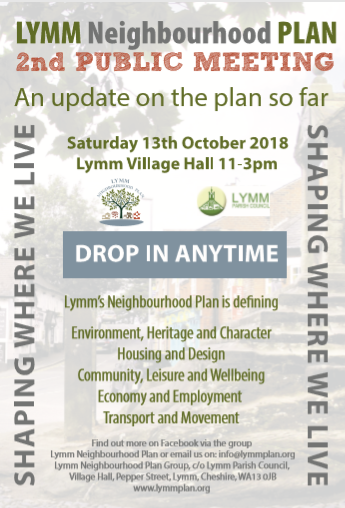 The Lymm Neighbourhood Plan group are looking to hold a second consultation event during October, to update residents with the evidence gathered so far towards what matters to Lymm residents; we expect to launch a detailed survey at the consultation to gather opinion and feedback from residents. More details to follow shortly. The council is currently working to deliver its draft Local Plan – which sets out the proposed approach to meeting the borough’s future need for homes, jobs and supporting infrastructure – but must now take into consideration recent changes to planning rules, as well as updated population projections. The Government has just published the revised National Planning Policy Framework (NPPF), and the Office for National Statistics has recently released the latest population projections for Warrington. The council needs to ensure both of these are taken into account in the drafting of the plan. It is now anticipated that the draft Local Plan will be published by the end of 2018, prior to a further round of public consultation early in 2019. We shall be asking each sub-group member to attend a number of evening meetings to discuss topics, prepare the evidence base and recommend further actions. If you have the relevant skills please consider putting your name forward as a volunteer, if you have not already done so. 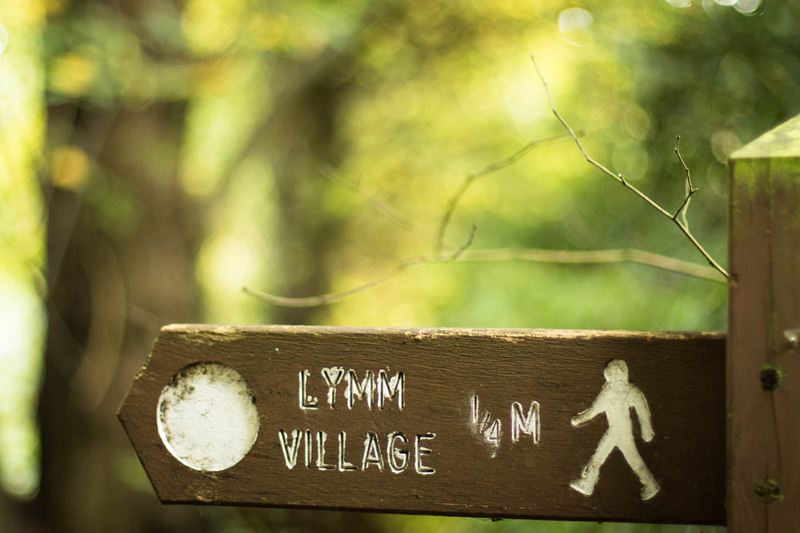 If you simply want to hear more about what the Lymm Neighbourhood Plan Working Group are doing, please join our email list to be kept informed. “Keep me informed” – keeping it simple, this list gets sent our updates. To sign up – sign up our contact page at https://www.lymmplan.org/contact/ & use the second form with the “Volunteer” option, or write to us at the Parish Hall. In other news, we have now sent an initial email to all those who have asked to be kept informed by email, if you did not receive an email from us please check your spam folders for 22nd March or drop us a note via our contact form – there were a very small number of email addresses where we could not decipher the handwriting. Lymm Neighbourhood Plan Group has received grant funding from Locality towards the cost of producing the Lymm Neighbourhood Plan. Locality is the national network of ambitious and enterprising community-led organisations, working together to help neighbourhoods thrive. The funding will provide for consultancy support from Cheshire Community Action to the Lymm Neighbourhood Plan Working Group. If you would like to receive email updates about Lymm Neighbourhood Plan progress and future consultations, please register via our contact page. The Lymm Neighbourhood Plan team have been busy reviewing the output from the consultation on 24th October 2017 at Lymm Parish Hall, applying for grant funding, and setting out plans for the next few months. We are updating this site on a regular basis, and will share information on this site, and publicise this via the Facebook Group and email distribution. If you would like to sign up for email updates, or have any questions, please use the contact form.